BBC World Service is an international multimedia broadcaster, delivering a wide range of language and regional services on radio, TV, and digital. It uses multiple platforms to reach its weekly audience of over 210 million people globally, including shortwave, AM, FM, digital satellite, cable channels, and social media. Its news sites include audio and video content, and offer opportunities to join the global debate. BBC World Service offers its multilingual radio content to partner FM stations around the world and has numerous partnerships supplying content to news websites, mobiles, and TV channels. As a global organisation, the BBC wants to create lasting positive relationships with future leaders, influencers, and decision-makers in journalism around the world. Chevening/BBC fellows will bring expertise and contacts from around the world, and in-depth knowledge of the changing needs and media habits of their audiences, as well as fresh perspectives on the way that we work at the BBC. After fellows return to their host countries, different areas of the BBC may continue to have a relationship with them, with alumnae reporting and contributing to BBC output where appropriate. The selected fellows will be offered the chance to develop their skills through practical experience, mentorship, and training at the BBC’s College of Journalism, working alongside experienced BBC staff to contribute to the production of real content and live projects. Who does the BBC World Service support? In 2017, BBC World Service will be opening applications for 2016/2017 Chevening Scholars who have worked as a journalist for two or more years, or have recently completed a master’s degree in journalism at a UK university. Selected scholars will complete the BBC World Service Group Professional Placement Programme at the end of their master's course. 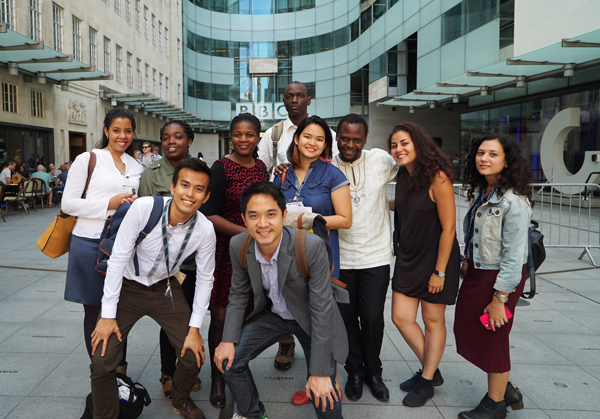 For more information on the programme please visit this page, or to see what 2015/2016 scholars (below) are doing whilst on placement, take a look at their #MyCheveningJourno blog for stories and videos of life at the BBC.